[156 Pages Report] The global vaccine adjuvants market is expected to reach USD 769.4 Million by 2021 from USD 467.0 Million in 2016, at a CAGR of 10.5%. The global market is broadly classified into product type, route of administration, disease type, applications, and application categories. On the basis of product type, the vaccine adjuvants market is segmented into pathogen components, adjuvant emulsions, particulate adjuvants, combination adjuvants, and others. The particulate adjuvants segment is expected to account for the largest share of the global market in 2016. The adjuvant emulsions segment, on the other hand, is projected to grow at the highest CAGR during the forecast period. This market is mainly driven by factors such as rising prevalence of diseases such as allergy, cancer, and HIV/AIDS; growing demand for advanced treatment options, and development of improved vaccine immunization. On the basis of route of administration, the market is segmented into oral, subcutaneous, intranasal, intramuscular, intradermal, and others. The intramuscular segment is expected to account for the largest share of the global vaccine adjuvants market in 2016. Factors such as the rapidly growing geriatric population and vaccines for improved immunization are propelling the growth of this market. Rise in collaborations and acquisitions by private organizations and increased funding by government bodies for research and development are also expected to drive market growth. On the basis of disease type, the vaccine adjuvants market is segmented into infectious diseases, cancer, and others. The infectious diseases segment is expected to account for the largest share of the global market in 2016. Factors such as high prevalence of infectious diseases, government & company initiatives, and high prevalence of cancer cases are expected to drive market growth in the coming years. On the basis of applications, the market is segmented into research and commercial applications. The research applications segment is expected to account for the largest share of the market during the forecast period. Growth in this segment is driven by factors such as ongoing research projects on new adjuvants, increasing initiatives by government bodies and companies, growing usage of many vaccine adjuvants commercially, and increasing incidences of zoonotic diseases. On the basis of application categories, the market is segmented into human vaccine adjuvants and veterinary vaccine adjuvants. The human vaccine adjuvants segment is expected to account for the largest share of the global market in 2016 and is also expected to grow at the higher CAGR. The large share of this segment can primarily be attributed to factors such as increasing initiatives by companies. 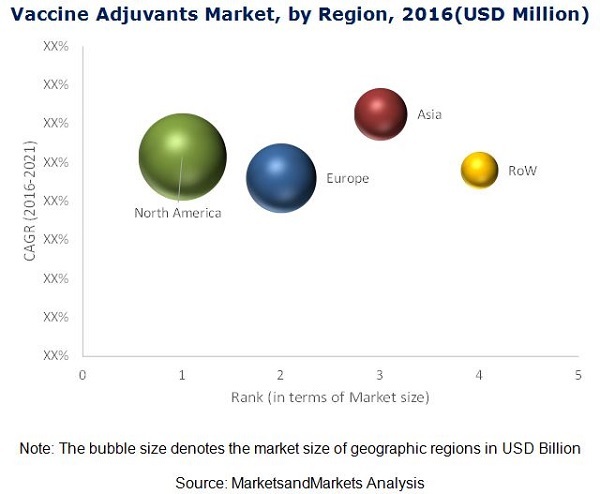 Geographically, the vaccine adjuvants market is dominated by North America, followed by Europe, Asia, and the Rest of the World (RoW). However, Asia is projected to grow at the highest CAGR during the forecast period. Growth in the North American segment is primarily driven by the increasing geriatric population and rising incidences of diseases in the North American countries. The major players in the vaccine adjuvants market are Brenntag Biosector (Denmark), CSL Limited (Australia), SEPPIC (France), Agenus, Inc. (U.S.), Novavax, Inc. (U.S.), SPI Pharma, Inc. (U.S.), Invivogen (U.S.), Avanti Polar Lipids, Inc. (U.S.), MVP Laboratories, Inc. (U.S.), and OZ Biosciences (France). This report aims to provide insights into the global vaccine adjuvants market. It provides valuable information on the product type, route of administration, disease type, applications, and application categories in the market. Furthermore, the information for these segments, by region, is also presented in this report. Leading players in the market are profiled to study their product offerings and understand the strategies undertaken by them to be competitive in this market. The above-mentioned information would benefit buyers by helping them understand the market dynamics. In addition, the forecasts provided in the report will enable firms to understand the trends in this market and better position themselves to capitalize the growth opportunities. The global vaccine adjuvants market consists of human and veterinary adjuvants that are used to improve the efficacy of vaccines. This market is driven by several factors such as increasing government funding for research, high prevalence of diseases, expanding biotechnology and biopharmaceutical industries, and growing focus on prevention of diseases. The high growth potential in emerging markets has opened an array of opportunities for the market. However, the high cost of adjuvant-based research and proven safety of adjuvants are hampering the growth of the global market. The vaccine adjuvants market is expected to reach USD 769.4 Million by 2021 from USD 467.0 Million in 2016 at a CAGR of 10.5%. This market is segmented based on product type, route of administration, disease type, applications, and application category. On the basis of product type, the market is segmented into pathogen components, adjuvant emulsions, particulate adjuvants, combination adjuvants, and other adjuvants. The particulate adjuvants segment is expected to account for the largest share of the global vaccine adjuvants market in 2016. High prevalence of infectious diseases and increasing funding for adjuvant research will drive the growth of this market segment. Based on route of administration, the vaccine adjuvants market includes oral route, subcutaneous route, intranasal route, intramuscular route, intradermal route, and other routes. The intramuscular segment is expected to account for the largest share of the global market in 2016. Rising geriatric population and vaccines for improved immunization are the key factors propelling the growth of this market. Based on disease type, the vaccine adjuvants market comprises of infectious diseases, cancer, and other diseases. The infectious diseases segment is expected to account for the largest share of the global market in 2016. High prevalence of infectious diseases and cancer is expected to drive market growth in the coming years. Based on applications, the vaccine adjuvants market is segmented into research applications and commercial applications. The research applications segment is expected to account for the largest share of the market during the forecast period. The large share of this segment can be attributed to factors such as ongoing research on new adjuvants, increasing initiatives by government bodies and companies, usage of many vaccine adjuvants commercially, increasing incidences of zoonotic diseases, and increase in the number of conferences and summits. Based on application categories, the vaccine adjuvants market is segmented into human and veterinary adjuvants. The human vaccine adjuvants segment is expected to account for the largest share of the global market in 2016 and is expected to have a higher growth rate in the application category segment. The large share of this segment can be attributed to the increasing initiatives by companies, vaccine adjuvants discovery and development, and increase in the number of conferences and summits. Based on geography, the global vaccine adjuvants market is segmented into North America, Europe, Asia, and the Rest of the World (RoW). The market is dominated by North America, followed by Europe, Asia, and the Rest of the World (RoW). However, Asia is expected to witness the highest CAGR, with the growth in this market centered at China and India. Rising prevalence of infectious diseases, increasing government investments for vaccine research and development, rising number of conferences and symposiums, and high growth in the Indian biotechnology sector are the major factors driving the market in the Asian region. 13.9 Avanti Polar Lipids, Inc. Figure 41 Company Snapshot: Agenus, Inc. Figure 42 Company Snapshot: Novavax, Inc.